One of the things I get asked most often is what books I would recommend about Goddesses, the Divine Feminine and being a Priestess. 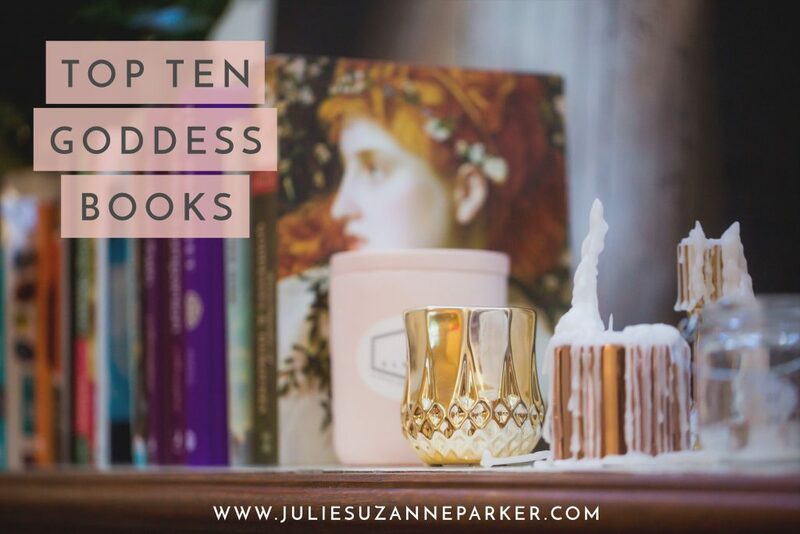 Reading is one of my life’s great joys and so I hope this list of my Top Ten Goddess Books is of inspiration to as many of you as possible. Please note that these Goddess books are specifically about that – Goddesses. There are many other books I could recommend about women’s spirituality, the Divine Feminine and more, but it is the Goddesses I am asked most about and so I’ve chosen to focus on those here. These are in no particular order – but all are certainly loved on my bookshelf and in my heart. Warrior Goddess Training by Heatherash Amara: This was one of the very first Goddess books I ever read and so it has a special place in my heart. Warrior Goddess Training helped me many years ago when I was still trapped in egoic thoughts of not being enough and filled with expectations of who I should be. Warrior Goddess Training really helps you tap into your inner warrior as a woman and contains lots of stories, rituals and exercises to support you on your journey. Goddess Wisdom by Tanishka the Moon Woman: I have only recently found the work of Tanishka and in truth I enjoyed this book a great deal more than I thought I would. I am not sure why I was initially not drawn to it, but Tanishka writes in a really easy and practical way that really helps to bring collective ancient Goddess teachings into the modern day. A lovely beginners book on the Goddess and one that I think is a must for anyone exploring their Divinity. Awakening Shakti by Sally Kempton: This one’s for all the yogi’s in the house – and even for those like me who flail about on the mat and hope you’re doing it right! This lush text by Sally Kempton pays homage to the Hindu Goddesses and the sacred feminine principle of Shakti. Sally brings you close to the heart and inspiration of Kali Ma, Lakshmi, Radha and many other Hindu Goddesses in a beautiful read. Goddesses in Every Woman by Jean Shinoda Bolen: This important Goddess book is about the power of archetypes and their use in looking at the psychological make up of women. Focusing on the Greek Goddesses of the ancient world Jean does an amazing job in helping bring the personality and behavioural traits of these mythic beings into a modern context and how they live within us as women of today. Once you see yourself in the bounteous Aphrodite, independent Artemis or warrior like Athena you will be left inspired on which parts of your light to shine even brighter and which parts of your shadow to nurture even deeper. Encyclopaedia of Goddesses and Heroines by Patricia Monaghan: This to me is the Goddess reference book of all reference books. There is no higher compliment that I could pay it than that. If a Goddess is not in here she may still be lost in the ether somewhere. She’s a big one and for reference not reading – but if you’re a Goddess devotee it’s a must have. Jailbreaking the Goddess by Lasara Firefox Allen: When I read the blurb for Jailbreaking the Goddess I couldn’t buy it fast enough. Anything that brings a fresh and and even revolutionary perspective to the Divine Feminine I feel is a great thing. Lasara has taken the Maiden, Mother, Crone archetypal life stages, (which are tied to biology and the physical life stages of a woman), and shares her five stage model of life encompassing beginnings, potential, creation, mastery, and wisdom. The reproductive connection to women’s life stages is diminished in a way that is incredibly refreshing, feminist and likely to be a lot more relevant and appealing to many women today. I love how Lasara talks about which Goddesses are most relevant at each stage of her model of life too. The Goddess Guide by Brandi Auset: This guide is my ‘go to’ book when I am looking for a Goddess to support me with something specific – creativity, fear, relationships, health. Why? It’s a reference guide to Goddesses and you can pick it up in search of inspiration or assistance in any area of your life and Brandi is right there with suggested Goddesses who will help you. So easy. So helpful. And so what I searched for – for a LONG time. And it was exactly what I hoped it would be when I found it. 365 Goddess by Patricia Telesco: This is such a lovely book and would make a perfect gift for yourself to sit on your bedside table or give to a sister. It contains one Goddess a day you can learn about for a year, each one offering you a reflection or inspiring insight. Goddesses from all over the world are represented in areas as wide as health, abundance, love, clarity and fertility. A lovely easy read and reference guide too. Goddesses: Mysteries of The Divine Feminine by Joseph Campbell: The only book on my list written by a man and I’m pleased to say that it’s a good one. Joseph was a prolific writer on the topic of the Goddess and the ancient world giving more than twenty lectures in the 1970’s and 80’s but this book was the first time his work was bought together in one place by Safron Rossia. Joseph’s work helps us to understand the connection between the Divine Feminine and the earliest Goddesses through to ones of more recent times. I always learn more about the Goddess when I read his work. The Goddess Path: Myths, Invocations and Rituals by Patricia Monaghan: Mmmmmmm…I love this book so much. If you’re looking to bring your love of the Goddess into your every day life then this is the book for you. Part guide, quest and ritual Patricia Monaghan has written a beautiful book to inspire you with pratical ways of honouring and bringing the Goddess to life. And with helpful suggestions on calling forth certain Goddess for what you are most desiring – it’s an easy ‘go to’ as well to ignite your inner power and supercharge your altar, spiritual practice and life. If you have another favourite Goddess book please share it with me below…I’ll likely add it to my collection! And if you have read some of these books already which is your favourite? I’d love to know! You’re so welcome Erica. Enjoy! Thank you so much for putting this together! It’s just what I’ve been looking for! It seems you are not alone there Jen – so many people have been asking for this one. Happy reading. That’s great Lissa. I hope you find another wonderful read in here. Thanks so much for this beautiful list, Julie. It’s one to treasure and I look forward to reading through it over time and learning more about Goddesses and their wisdom for our lives. There are some true gems in here Terri. I know you will love them. Julie, thank you for this beautiful list. Awakening Shakti is sitting on my bookshelf and I’ve added a few of these to my wishlist, knowing soon they will keep her company. Looking forward to inviting more Goddesses into my life, and your list certainly inspires the path forward – Thank you! That is a wonderful book Amie – I loved it. Hope you find another favourite in here too!